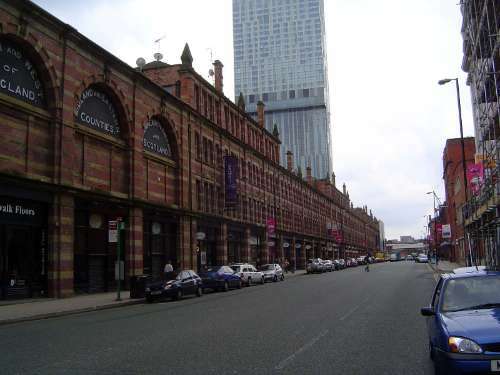 In 1801, Manchester had 75,000 people; a century later, it had grown 700 percent to 505,000. Thank cotton. The peak year for the local textile industry was 1913, when Lancashire produced an incredible two-thirds of the world's cotton cloth. The city's population continued to grow to 716,000 in 1931, but the cotton industry by then was very sick. Today the city's population is down to 393,000. 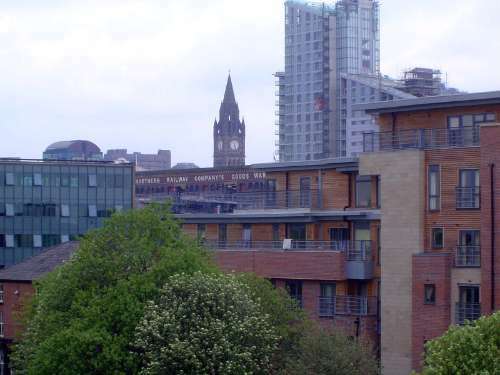 Not to worry: cities can be remarkably resilient, and a lot of money has gone into rejuvenating Manchester. Besides, if the city has lost almost half its people, a lot of that decline is a result of suburbanization: Greater Manchester, in other words, was stable at 2.4 million throughout the 20th century. We look here, in short, at a story of economic rise, fall, and rise again. 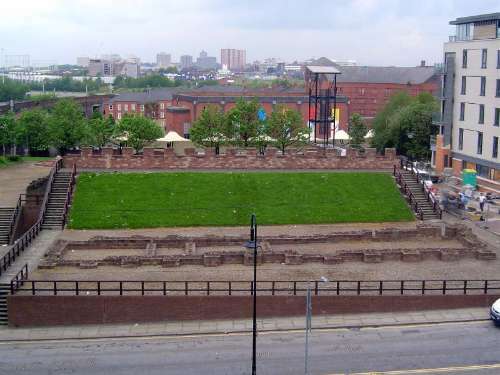 Begin at the beginning: the archaeological site of Castlefield, a Roman fort from A.D. 79. 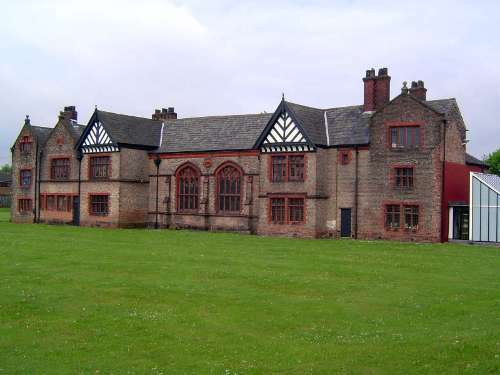 Fast forward more than a millennium to Ordsall Hall, the Radcliffe family home from 1354 to 1662. 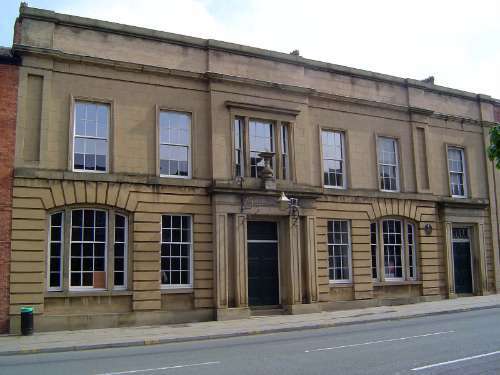 It was purchased by the Salford Corporation in 1959 and is now a museum. 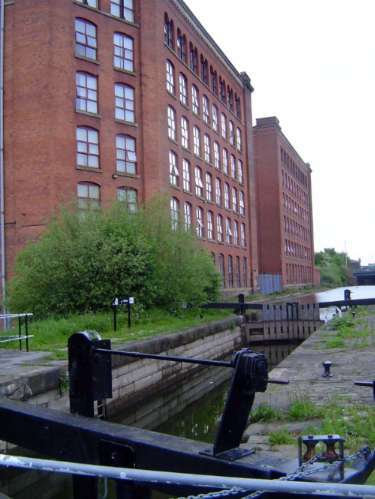 As an industrial center Manchester begins here, with the Bridgewater Canal, built between 1759 and 1769 by Francis Egerton, the Duke of Bridgewater. 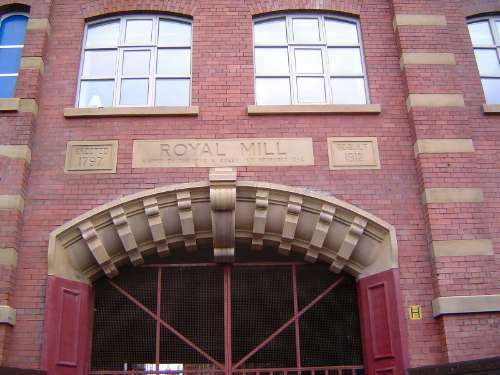 He wanted to move coal cheaply, and he succeeded: not only did Manchester now have cheap coal but textile mills had a source of mechanical power. 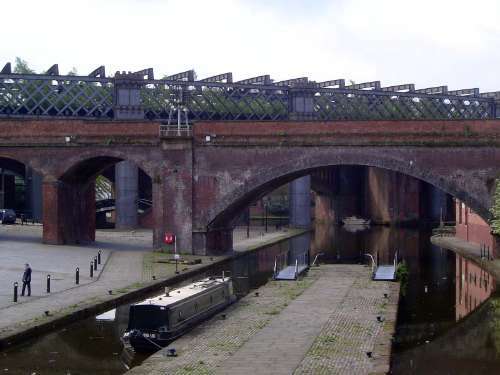 More broadly, the canal is a milestone in British transport history, because it initiated the canal mania that in a few decades covered the island with a navigation net. It is also remarkable because it has no locks. 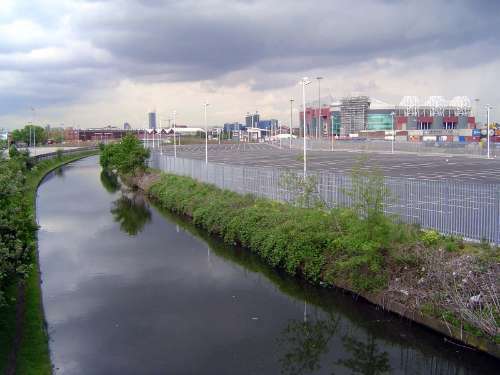 The view here, taken from a point a couple of miles west of Manchester, gives you a fine juxtaposition of old and new: there on the right, wrapped in parking lots, is the Manchester United football ground. 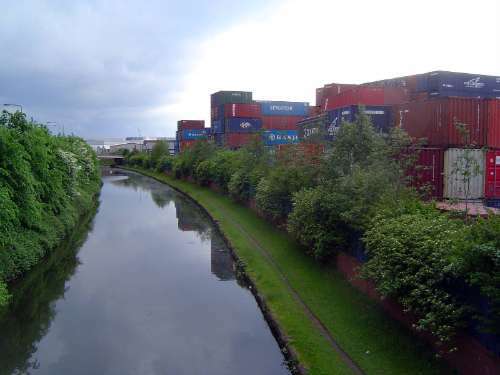 Another view of the Bridgewater Canal, close to the last one but this time juxtaposing it with a container terminal. What? A container terminal 35 miles from the sea? Yep: thank Euroterminal. Five freight trains from the continent arrive here daily via the Channel Tunnel. 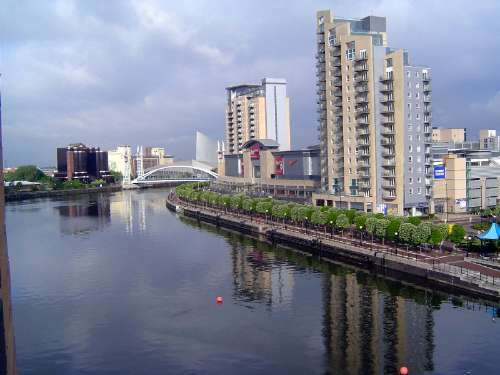 The Rochdale Canal (1804-6) extended the Bridgewater Canal eastward from Manchester across the Pennines; in conjunction with a third canal, the Calder and Hebble, it linked Liverpool to Hull on the east coast. 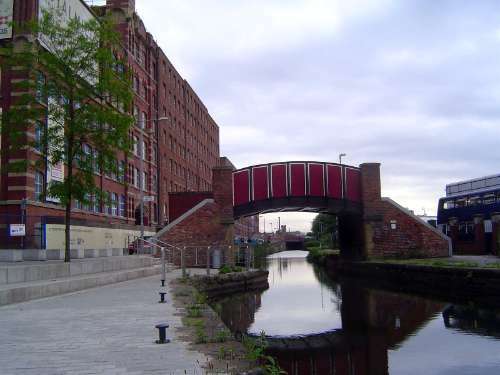 Here's the Rochdale Canal in the district called Ancoats, a couple of miles east of central Manchester. The McConnel and Kennedy mill opened here in 1797--not long after the granddaddy of them all, Richard Arkwright's mill of 1780. In 1825, the eminent German architect Karl Schinkel wrote that "at Manchester since the war 400 large new factories for cotton spinning have been built, several of the size of the Royal Palace in Berlin, and thousands of smoking obelisks of the steam engines 80 to 180 feet high destroy all impression of church steeples." (Quoted in Lancashire: Manchester and the South-East, by Clare Hartwell, Matthew Hyde, and Nikolaus Pevsner, 2004, p. 258). A decade later, Alexis de Tocqueville came by and reported that three-quarters of McConnel and Kennedy's 1,500 workers were women and children. 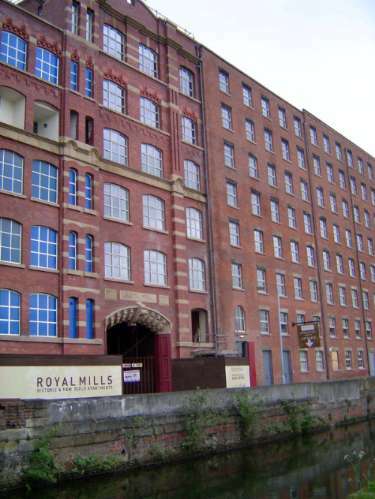 Another view of the McConnel and Kennedy mill, rebuilt in 1913 as the Royal Mill. Entrance signs, still basking under the glow of a royal visit. During World War I, the huge Indian market turned to Japan for cloth. 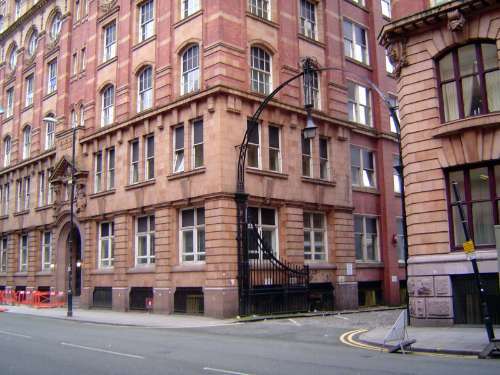 That was the beginning of the end for Manchester's textile industry. After several dismal decades, the city has found new life for the old mills. 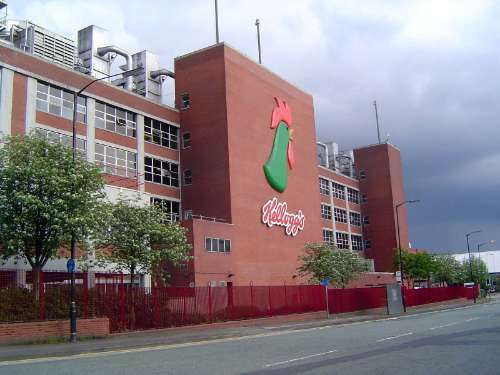 Another nearby mill, the Vulcan Works. On the back side, proof of the new use. 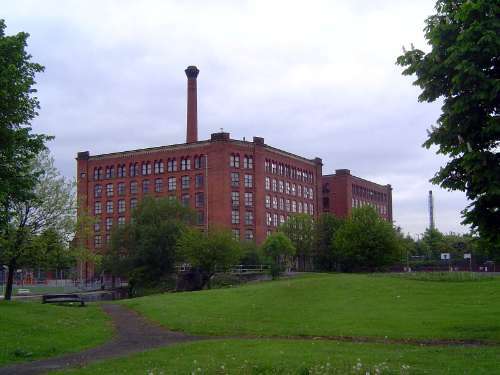 A mile to the east, the Victoria Mills at Miles Platting. 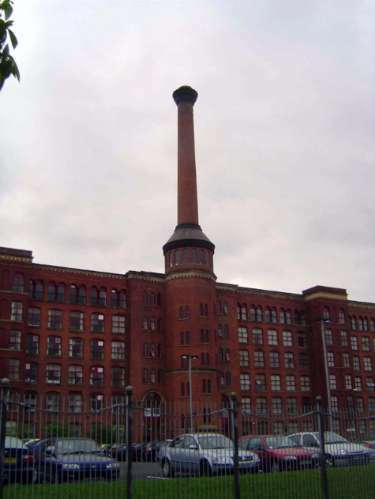 Built between 1867 and 1873, the mill consisted of two identical blocks sharing a common engine house--and smokestack. There hasn't been any smoke since 1960. The mill has been converted into a mixed-use building, including schools, offices, and apartments. 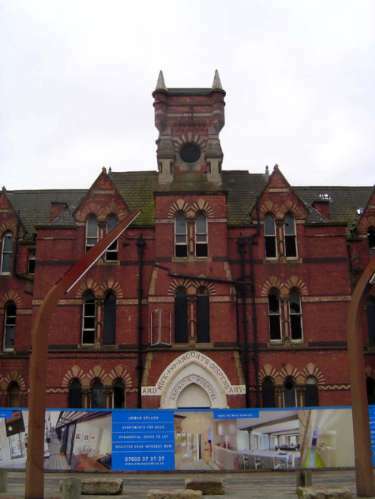 The Ancoats hospital, under conversion to apartments. The mills were once surrounded by slums, now cleared. 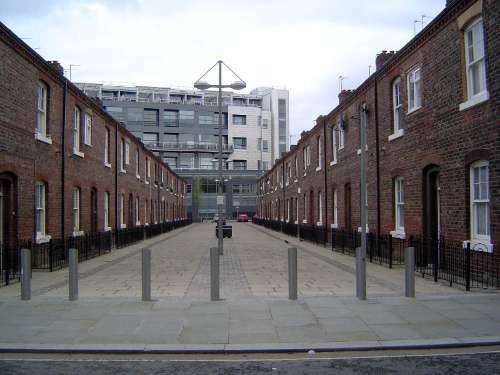 Here's perhaps the first slum-clearance project at Ancoats. 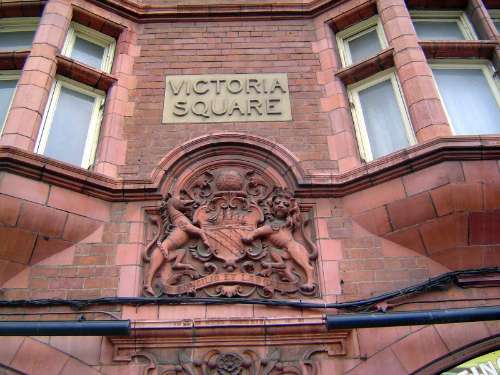 It's Victoria Square, built in the 1890s after a municipal design competition was won by the firm of Spalding and Cross. Like so many urban-renewal projects, this one had rents too high for mill workers, who were displaced to more distant slums. 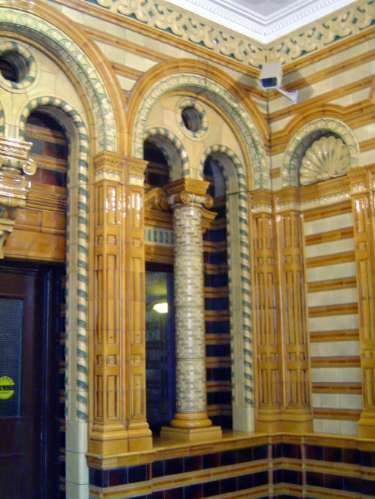 The original entrance, now blocked. The city's arms carry its no-nonsense motto, Concilio et Labore, "Counsel and Labor." The central courtyard of Victoria Square. Getting in without a key takes some doing: the entrances are all heavily gated. Across the street, a low-rise version of improved worker housing. Like Victoria Square, it was too expensive for workers. Meanwhile, railways arrived. 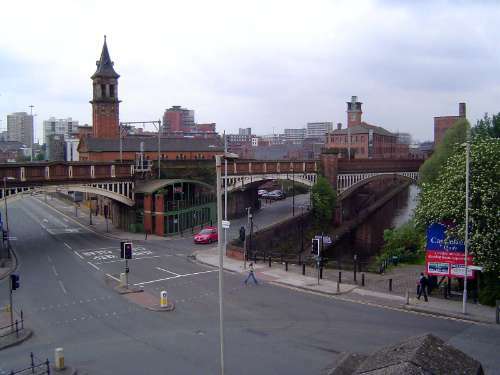 Here's the convergence of the Rochdale Canal and the Manchester South Junction and Altrincham Railway, opened in 1849. 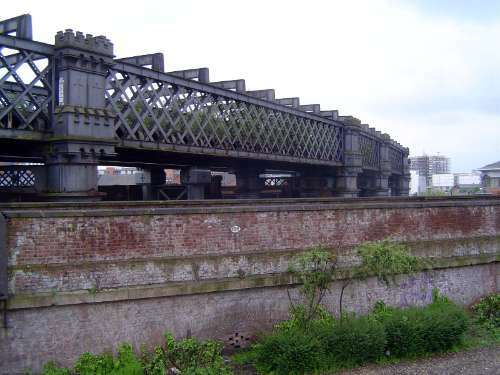 The terminus of the Bridgewater Canal, crossed by the MSJ & AR Viaduct of 1849 and, behind it, the steel Cheshire Lines Viaduct of 1877. Another view of the two railroads, here at Roman Castlefield. 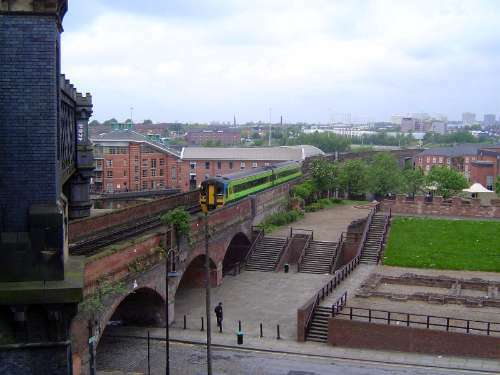 The brick viaduct is now used by Metrolink, a commuter railroad. A closer view of the Cheshire Lines viaduct, which despite its reliance on iron insists on medieval castellation. Both these railways were latecomers compared to the Liverpool and Manchester, which opened in 1830. 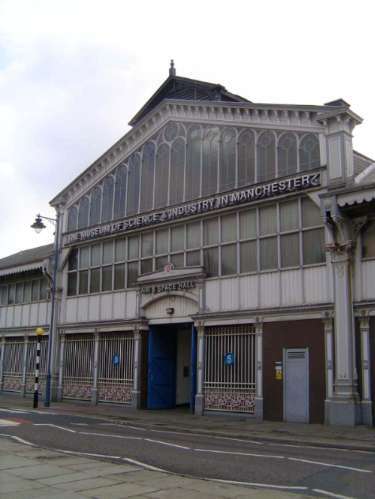 Here's its main and original Manchester station, the Liverpool Road Station, now part of Manchester's Museum of Science and Industry. 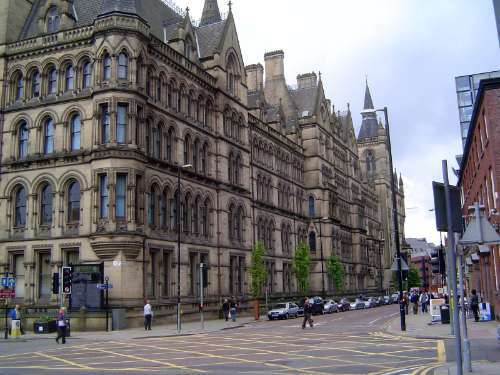 The same building showing its great length. The part of the building shown in the previous picture is near the far end. 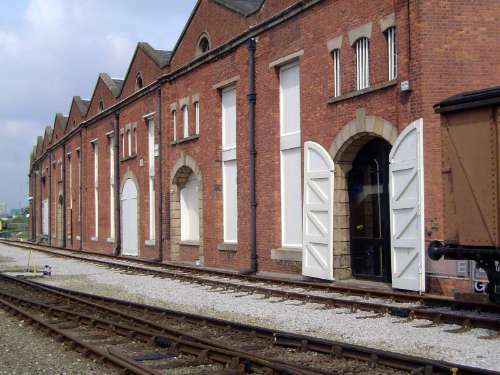 Behind the station building is a three-story cotton warehouse from the 1830s. 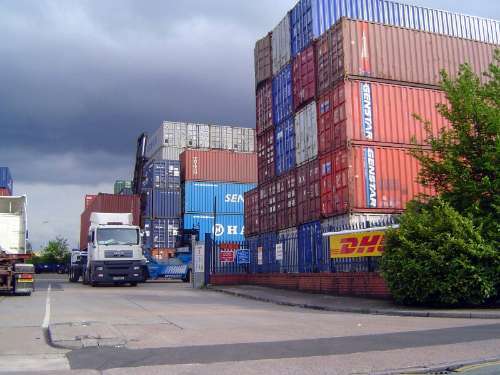 A goods warehouse, built mostly to handle food arriving from Liverpool. Herculean cast-iron pillars support the tracks approaching the station. 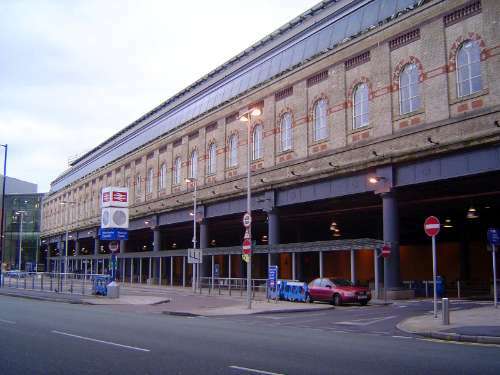 After 1876, food arriving at the station was sold at the Lower Campfield Market Hall, which later became the City Exhibition Hall and is now the Air and Space Hall of the Museum of Science and Industry in Manchester. 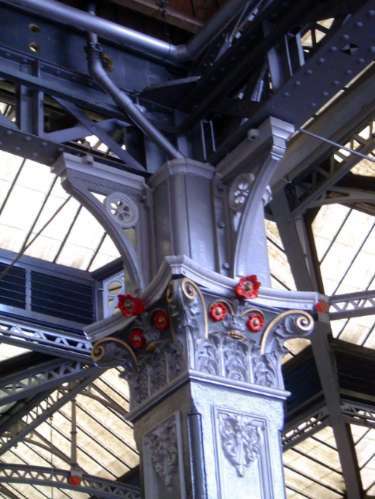 An interior detail, with cast-iron skeleton and glass roof. 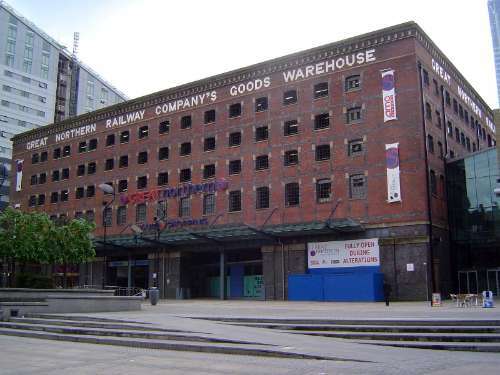 The former goods warehouse of another railroad, the Great Northern. 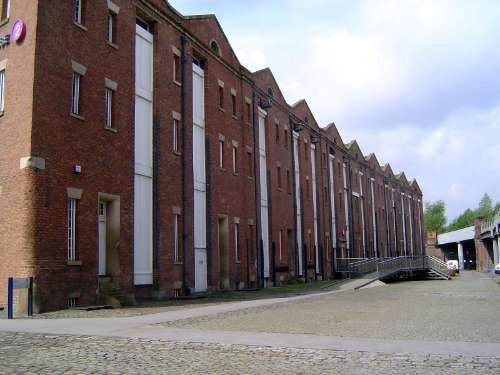 Built in 1898, the warehouse has the longest Victorian facade in England, but it wasn't just big: it was extraordinarily innovative, with a lower-level tunnel through which canal boats could come and go. 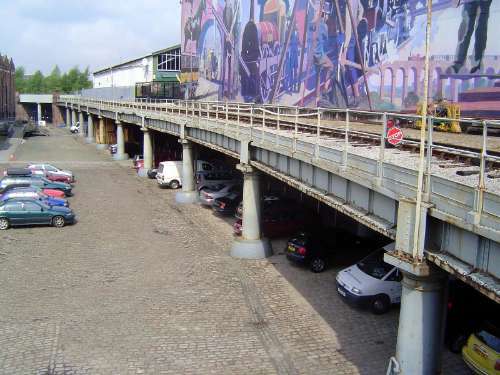 Above, railroad tracks ran on sidings where goods could be transferred to trucks or canal boats. Hydraulic elevators moved goods between floors. Call it Pioneer Intermodal. The warehouse closed in 1969 and the city bought it in 1978. 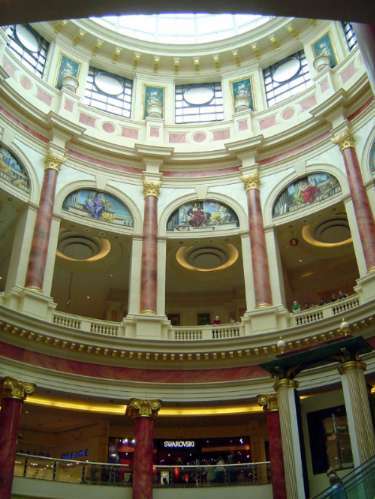 It's been renovated and is now the Great Northern shopping and entertainment center. 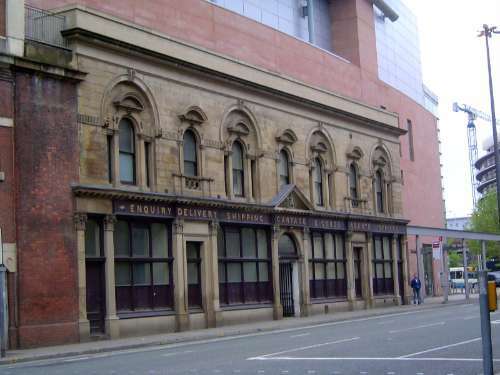 Still active as a railway station, the Piccadilly Station of 1880-83 was originally built in 1842 by the Manchester and Birmingham Railroad. At one end of the station the obsolete and truncated freight station survives, or at least its facade survives, either by accident or intent. Across the street, this remarkable building. You'll never guess. There's a hint in the line of oversize doors, but you'll still never guess. 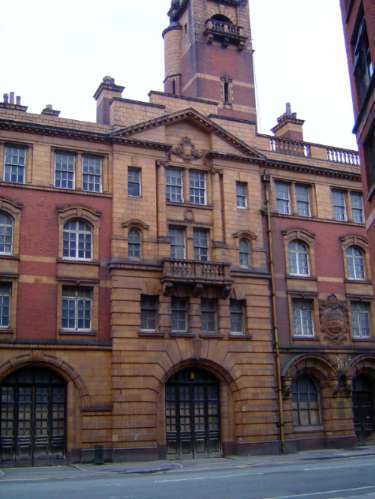 So I'll tell you: it's the London Road Fire Station, built in 1904-6. Why all the upper floors? At least in part because the firemen lived here--with their families. 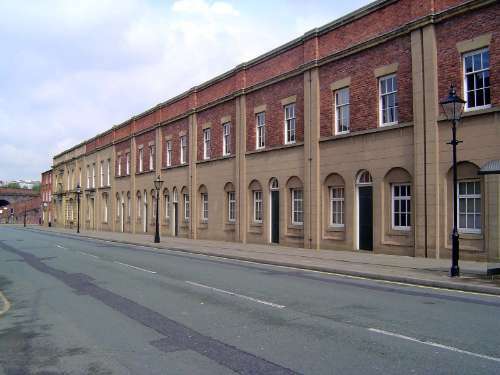 One reason for putting the fire station here was that we're on the edge of a textile warehouse district centered on Whitworth Street. 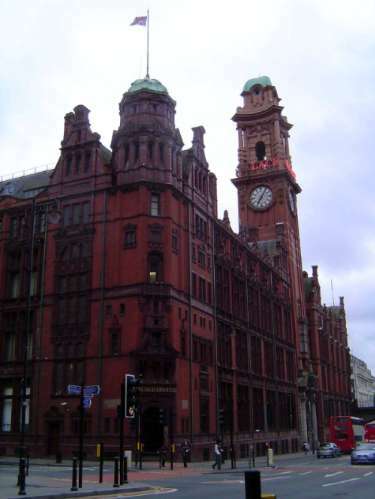 This is India House, designed by the prolific Harry Fairhurst and built in 1906-08 for the largest packer, Lloyd's Packing. The building is steel and concrete; that way, there could be lots of windows, a big plus for people examining cloth, either to buy it or inspect it for packing. 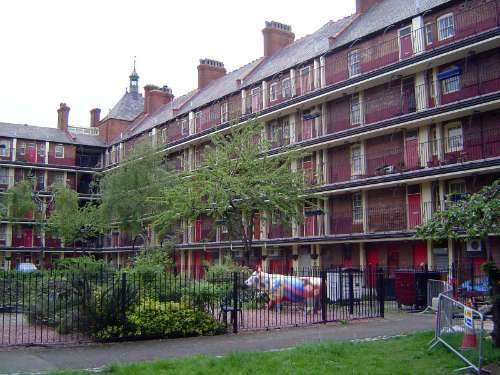 Now the building is low-rent housing run by the Northern Counties Housing Association. 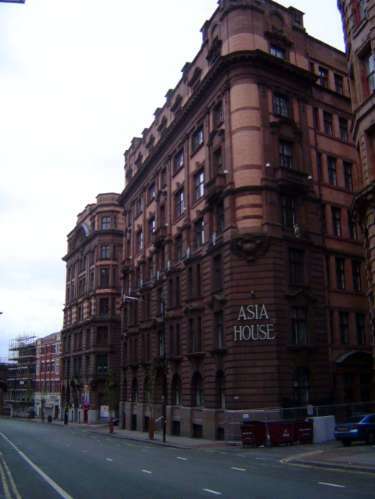 The adjoining Lancaster House, 1909-1912, also by Fairhurst for Lloyd's Packing. 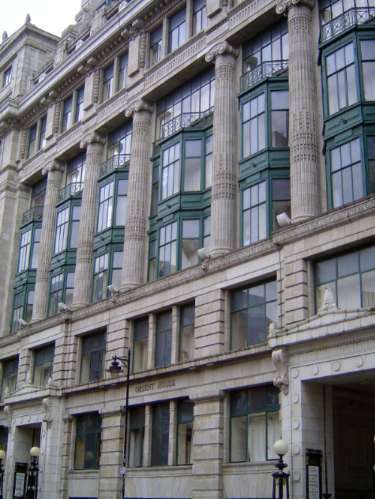 As well as running a packing operation, Lloyd's rented rooms inside the building to trading companies. Gloomy indeed: Asia House, by I.R.E. Birkett, 1906-1909. How far could glass be taken? See for yourself here at Orient House, from 1914. It, too, is now part of the Northern Counties Housing Association's Grancy Village. 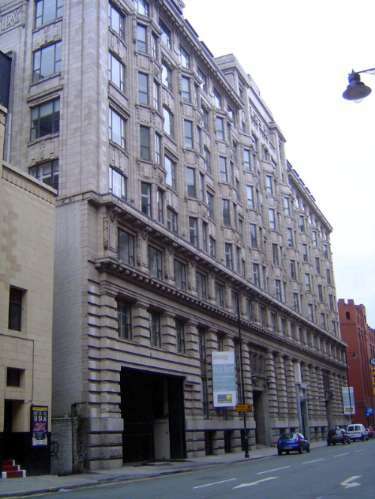 Another case: Bridgewater House, designed by Fairhurst and built about 1912. Its height rose to the 108-foot limit imposed by the city. The city's industrial wealth supported the development of a massive downtown. 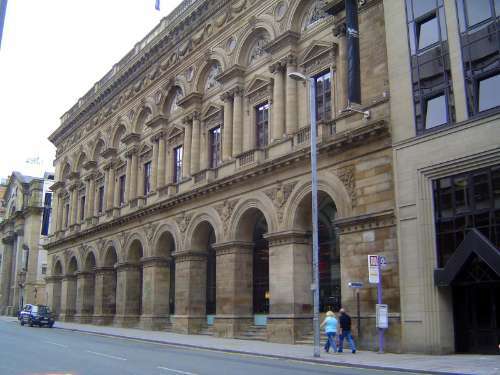 Here, the Free Trade Hall of 1853-56. Pevsner admired it greatly. For a long time it was the home of Britain's oldest orchestra, the Halle. Now it's a Radisson hotel. Next door: the Theater Royal of 1845, replacing a still earlier theater. This was a live theater until 1921, when it began showing movies. Sound arrived in 1929 and Cinerama in 1963. 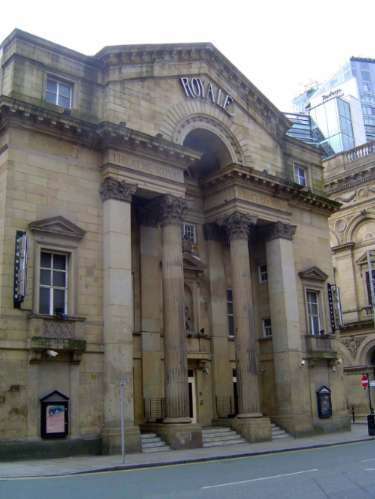 The building became a bingo hall in 1972 and the Royale, a disco, in 1989. 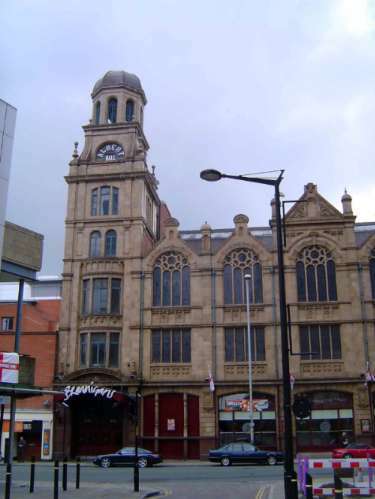 Another case of reuse: the Albert Hall, from 1910. 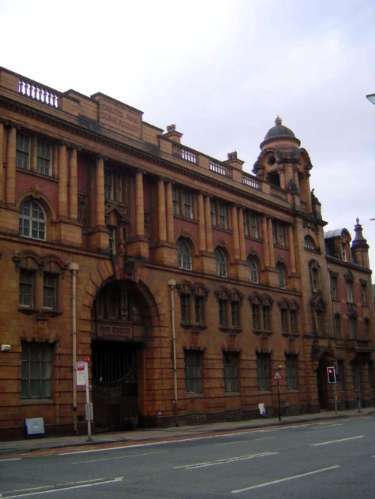 Built as the Methodist Hall for the Manchester and Salford Wesleyan Mission, it could seat 2,000 people. In 1999, it became a pub, Brannigan's. 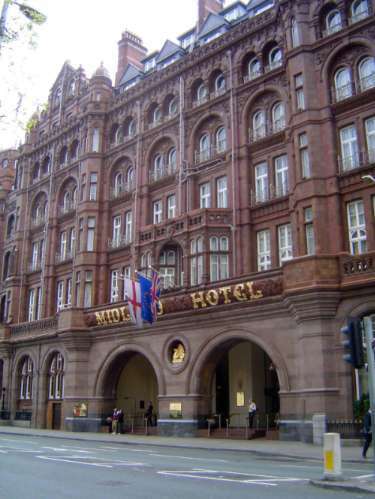 Decidedly more proper, the Midland Hotel, 1898-1903, was designed by the Midland Railway's architect, Charles Trubshaw. As an entrance plaque recounts, Mr. Rolls met Mr. Royce here. Their company emerged shortly. 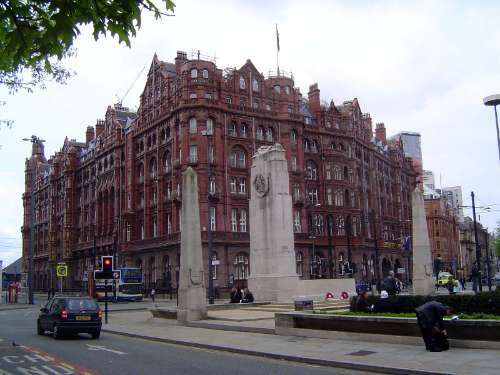 Another view of the hotel, behind a war memorial. The equally massive town hall, seen here from the back of its unusual, triangular plan. 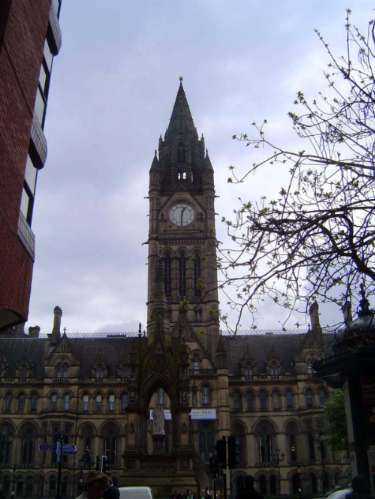 The front side of the town hall, 1868-77, designed by Alfred Waterhouse in what has been called Wagnerian Gothic. 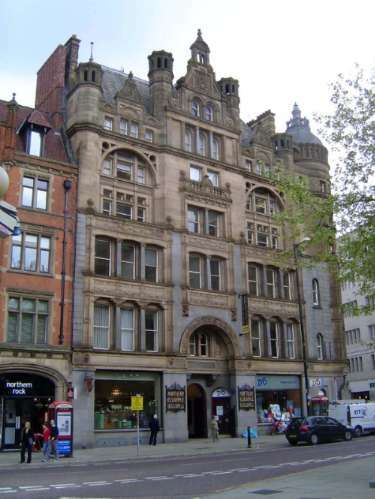 Commerce was never far away; here, across the street, is the office of the Northern Assurance Company. 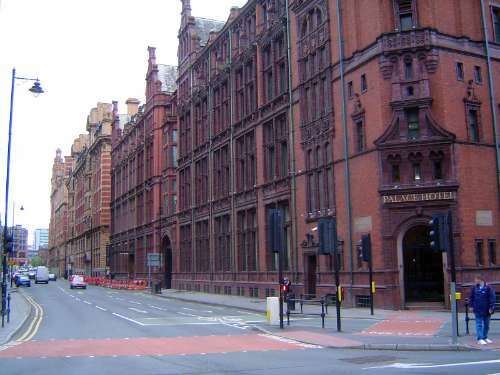 Nearer to the Whitworth Street warehouses is the huge building of the Refuge Assurance Company, built between 1891-1910 by Alfred Waterhouse, father and son. The company was here until 1987, when a hotel conversion began. 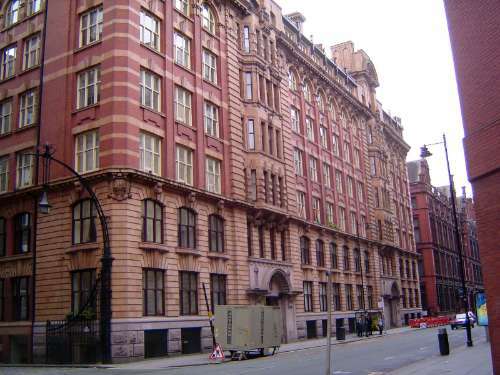 Now the Palace hotel, the Refuge Assurance Company stretched down Whitworth Steet to India House. Bridgewater House is on the other side of the street and faces the lineup. A detail from Refuge Assurance. 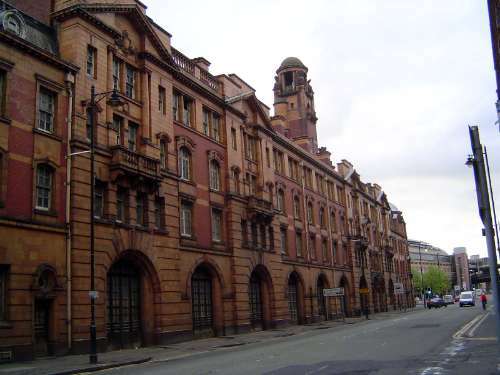 By the 1890s, Manchester's millowners were looking for an alternative export route, one where they would no longer be gouged by shipping companies in Liverpool. They decided to create their own port, 35 miles inland. 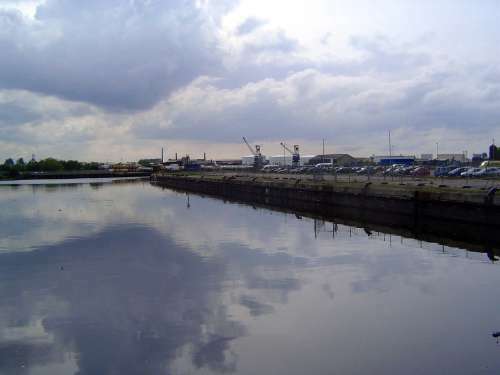 Here's a bit of the result, the Manchester Ship Canal, which opened in 1894 and was built to the same depth as the Suez Canal so any ship using the one could use the other. The Canal had a hard time in its early years, because the Liverpool dock owners (naturally) lowered their rates. 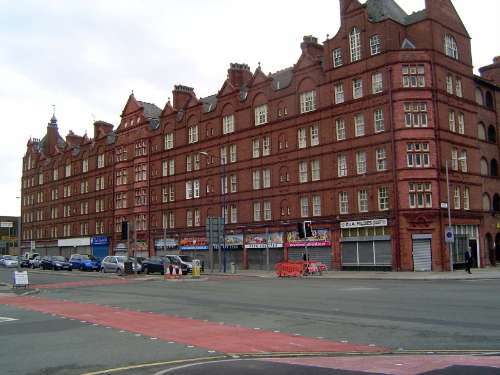 Traffic grew slowly, but as this picture hints the Canal in time became the heart of a new industrial Manchester. 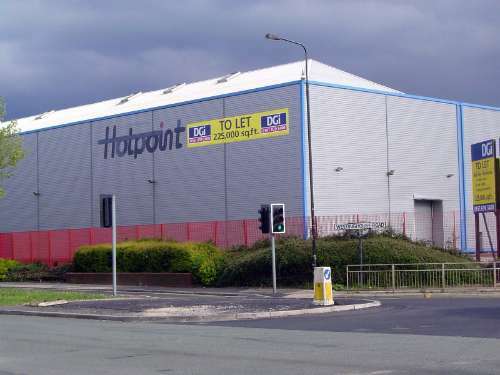 That new heart arose at Trafford Park, the world's first industrial park, built on the site of the estate--Trafford Park--of an aristocrat who knew when it was time to sell. 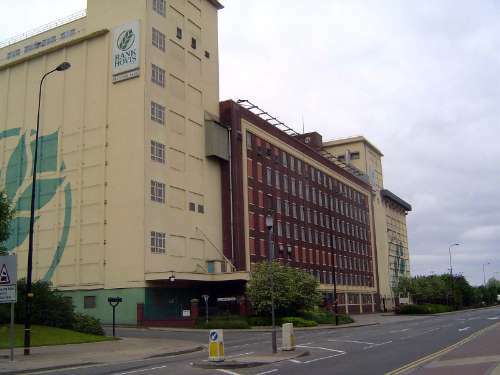 One of the first tenants was Rank Hovis, which began milling here in 1914. A canal-side grain elevator was connected to the mill by an underground conveyor belt. Look who arrived in 1938--and they're still there, cranking out those yummy flakes. Some of the biggest early tenants, like Ford and Westinghouse, left a long time ago; here's one that left only recently. 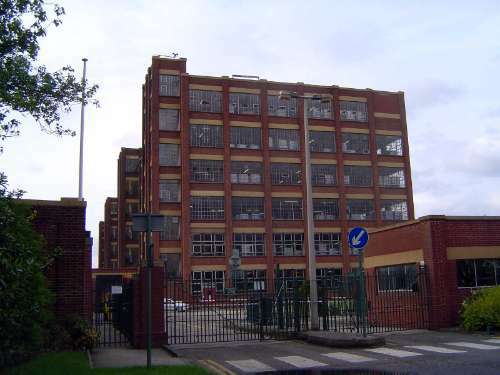 Others have stayed put: here, for example, is a very large building that is only one part of the Procter and Gamble plant at Trafford Park. 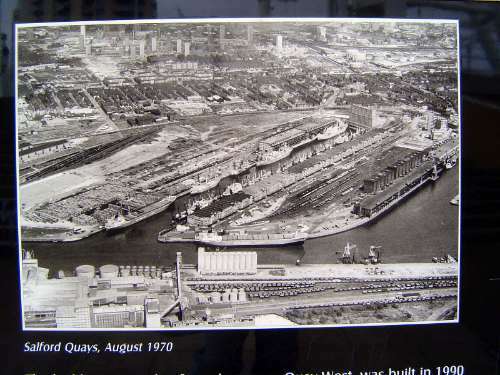 Ships using the Manchester Ship Canal not only served factories at Trafford Park but continued to the docks at Salford Quays, a couple of miles from downtown Manchester. Those docks, like the docks of London, have been recycled. This is the same group of docks shown in the last picture, but now you see high-rise apartments on either side of the fuchsia Lowry Outlet Mall. 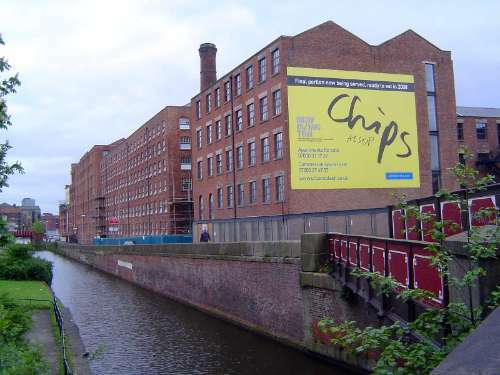 You can also see a footbridge and on the other side of the Canal a lineup including the Rank Hovis mill and, to its right, the northern branch of the Imperial War Museum, with a raking roof. 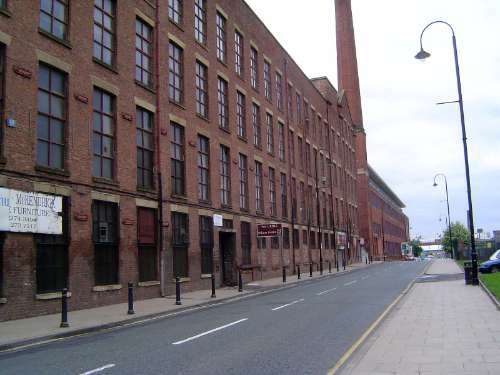 The dark building on the other side of Rank Hovis is Peel Properties, the company that still controls both the Canal and Trafford Park. 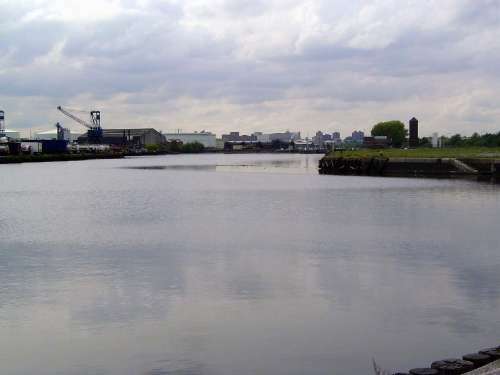 The company sold the then-derelict docks to Salford City Council in the 1980s. Some 30 million pounds of public money went into dock rejuvenation. 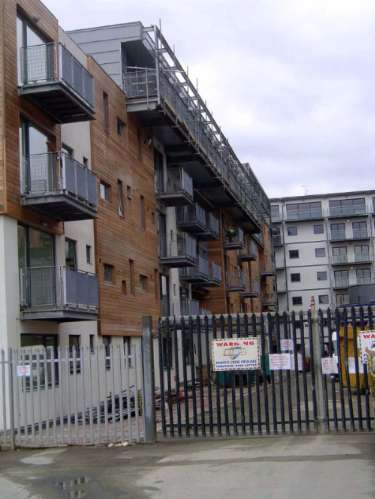 Another view of the renovated dock area, here showing the three bow-like profiles of the NV Buildings, apartments built by Countryside Properties. 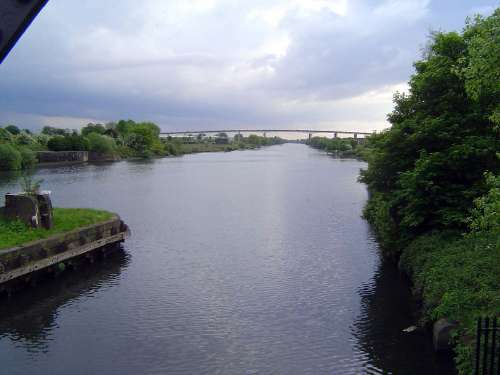 This is the Manchester Ship Canal at Barton upon Irwell, a few miles west of Manchester. In the distance is the M60 ring road. The Canal carried 925,000 tons of freight its first year, but the figure rose to 15 million in 1963. 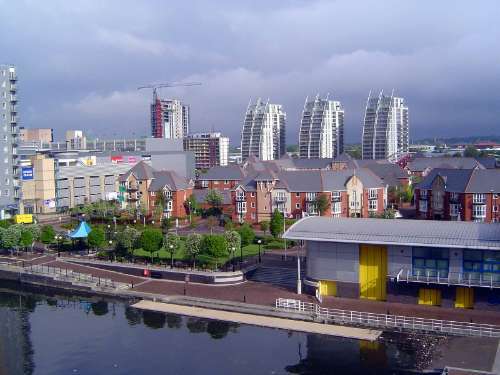 Manchester was then Britain's third largest port. But the game's not over, at least not for Peel Properties. 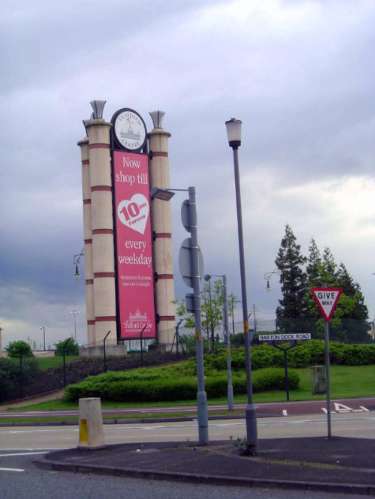 One of its more garish undertakings is Trafford Park Center, Manchester's biggest mall. As the glass domes hint, it was inspired--no, sorry, that's the wrong word--it was corrupted, by Las Vegas. You don't believe me? But where are we? Could it be the Normandie, bound for Le Havre? 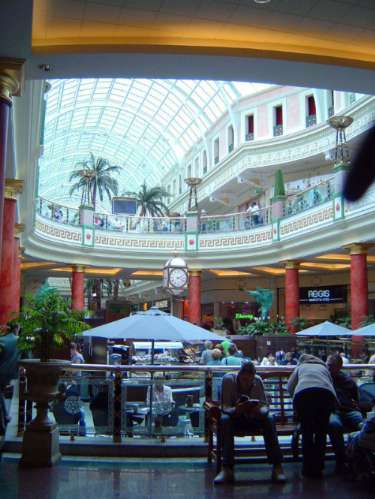 Ah, no, it's the Trafford Mall food court. 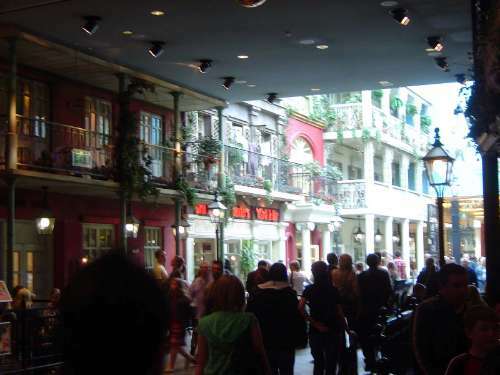 Have we somehow stumbled into the French Quarter? Non, monsieur, we are just leaving the food court. Qu'est que c'est? Has somebody painted the Emperor's tomb? 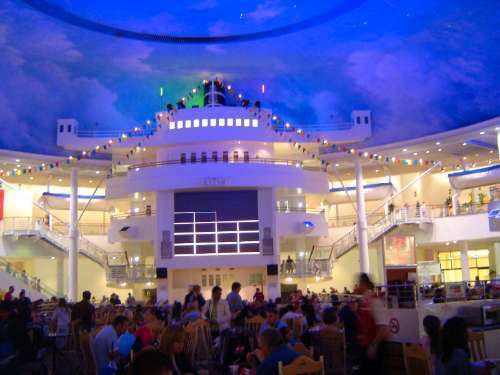 No, no, a thousand times no: behold the magnificence of the great cyclinder supporting the mall's glass dome. Just don't tap the columns. "Tink," "tink." 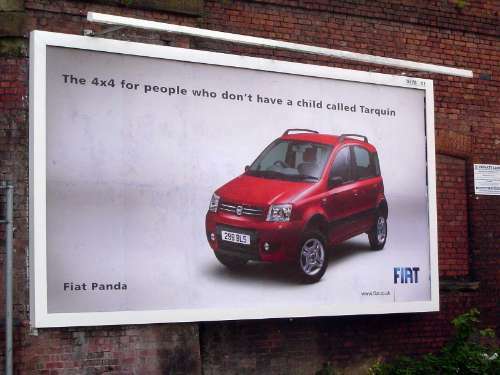 They're about as solid as a tin can. 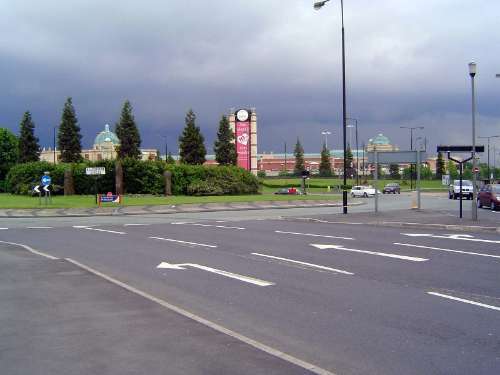 John J. Parkinson-Bailey, writing in Manchester: An Architectural History(2000), calls Trafford Park "shameless" but "warm, scrupulously clean, and free of smoke, exhaust fumes, dogs and beggars." What more could anyone want? Besides, it's open Wednesday night. Back downtown, Cool Britannia rises. 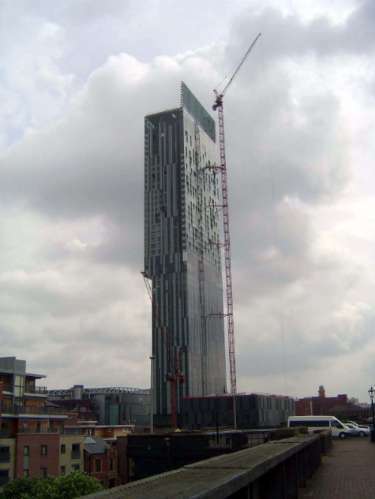 Here's Manchester's contribution, the Beetham Tower, under construction in 2006 and apparently destined to be a mixed-used project including a Hilton hotel. 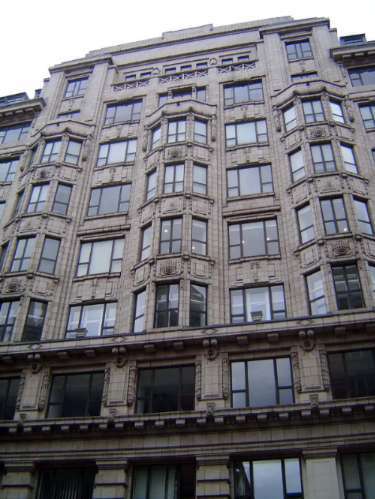 The 1,800 square-foot penthouse was on the market in 2011 for 900,000 pounds. We're having a good time again, especially with British wit, ever class conscious. Ever ready to take a dig at the rich.